From Ridge's roof. 20 second exposure. The weird curvy line in the sky on the left is a helicopter moving. Oh my. Quite the blaze. Photo ops like that make you appreciate a good camera. Beautiful. I miss Ridge. 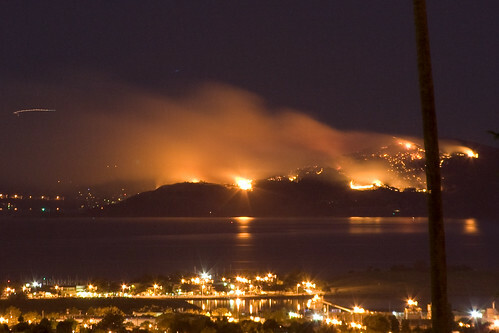 Hi - Angel Island Association (the nonprofit that supports the park in preservation, restoration and interpretation of its natural & historic treasures) is putting a collection of some of the better photos of the fire on its web site www.angelisland.org If you'd be willing to share your photo there, please send a jpg to aia@angelisland.org with your permission to use it. You could also spread the word that Angel Island Association needs everyone's support now more than ever -- we welcome all new members and donors!